Using the ideas form the previous post, I wanted to make a Vargr subsector. I used my random subsector generator and selected Vargr as race and backwater as settlement. Everything else was using the default settings. Using this subsector I also wanted to try the new print style at TravellerMap. I must have been very lucky. On the first try a very nice subsector was generated. I only had to move three worlds to make room for the names of the Interstellar States. There are backwater independent worlds and 2 interstellar states here. Lets find the adventure and the place called home. To do so we need to invent some background for this subsector. Lets say that the Tingoeg Union is an expansive Vargr State, and that the Kague Territory is the reaction to that. 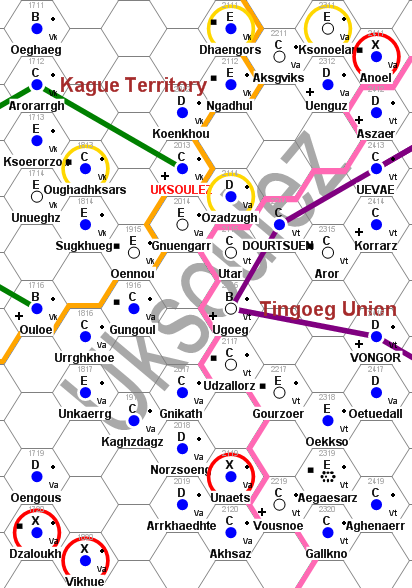 To stop the Tingoeg Union expansion a charismatic Vargr called Kague united a number of planets. That was 100 years ago. Now these 2 states have fought a few wars, and there is currently a cold war going on. The independent planets are part of a neutral zone. 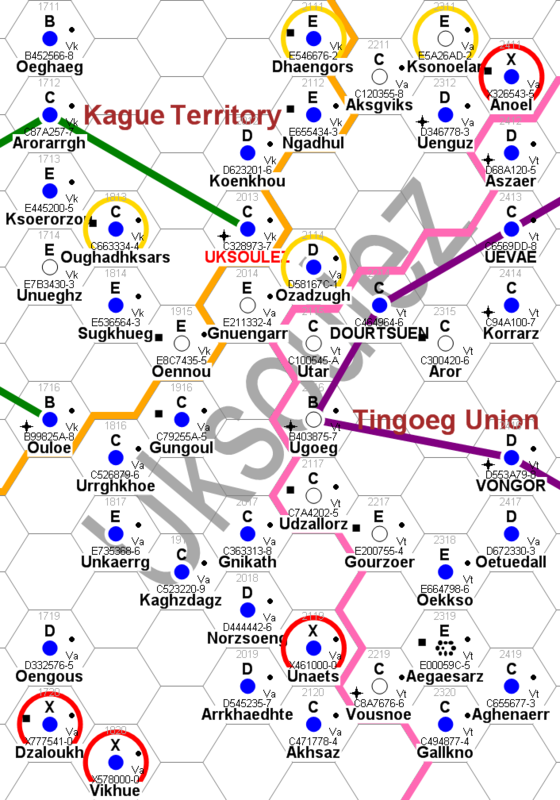 At Unaets (2119) the PCs can help the Kague Territory can set up a spy station. Ozadzugh (2114) is balkanized. Tingoeg Union and Kague Territory support different nations. The PCs can spy or fight in wars. Dzaloukh (1720) has tech-level 0. Has there been a war here? The PCs can help survivors. A J-1 ship can reach lots of worlds in both interstellar states. The PCs can trade and do other jobs using their old J-1 trader. Gnuengarr (2014) is a low tech world with almost no atmosphere. The PCs can ship supplies here, and someone might try to stop them. A place called home might be Uksoulez (2013). It’s a high population world where the PCs might know some people that can help them or can employ them. An alternative might be Dourtsuen (2214). Map made using Traveller Map Post Function. Click map for larger version! All ideas from the previous post are now fulfilled. There are a number of backwater independent worlds. There are 2 interstellar states. There are obvious adventures. Finally, a place that can feel as home has been suggested. After 116 votes, the Vargr IMTU poll is now closed. See the results at here and compare it with the other polls. The new poll is about the 3:rd Imperium. t.A.T.u. is also a russian girl band.